Stuttgart/Grenchen. Porsche Design is re-releasing a milestone of watchmaking art: the legendary Chronograph I. The world's first black watch and simultaneously the first product released by the luxury brand Porsche Design made horological history 40 years ago. It also caused quite a heated discussion, since this automatic chronograph – which was considered inconceivable at the time – had been designed in matt black and was completely unadorned. The new edition of the watch, the Porsche Design P'6510 Black Chronograph, with a diameter that has grown by 6 mm to 44 mm, is the last item in the P’6500 Heritage Collection. In 1972, Ferdinand Alexander Porsche founded his own design studio in and the luxury brand Porsche Design. His first product was a watch. With his black Chronograph I, he anticipated a trend that has become an integral aspect of the watch industry and was considered revolutionary at the time. For the designer, however, the deep black look was nothing more than functional: The watch takes a page from the playbook of the non-reflective race car instruments, which are entirely matt black, except for the indices and hands. For the Chronograph I, this meant a black dial, white lettering and hands and baton hour markers filled with a white luminescent substance. The only touch of colour is the long stop-second hand, which is in red. This avoids unwanted reflections and guarantees perfect readability of the watch. Functionality and aesthetics were equal partners for Professor Ferdinand Alexander Porsche; neither side was allowed to dominate the other. In his words: "If you analyze the function of an object, the form often becomes obvious. "That credo is the guiding principle for all Porsche Design products to this very day. Nothing serves a decorative purpose, what draws the attention are the clear forms derived from the function and carefully selected, authentic materials that are processed according to the highest level of craft. 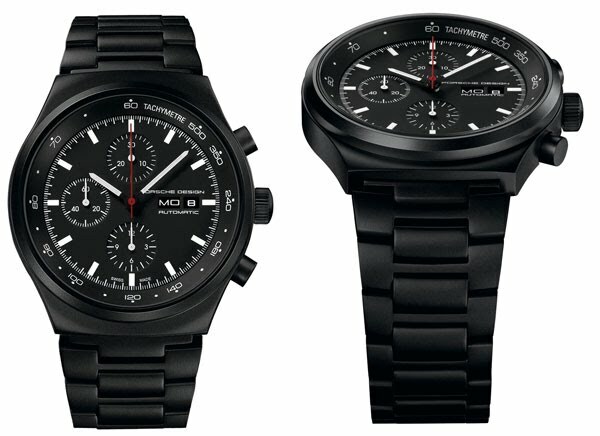 The re-release of the black chronograph, the P’6510 Black Chronograph, is patterned after the original model of 1972, but some aspects of it were adjusted to suit modern standards. The case’s diameter grew by 6 millimeters and is now 44 millimeters, and the black colour was not painted on, but rather coated with PVD (physical vapour deposition) to make sure that the black layer was even more durable. Ticking inside the watch is an ETA chronograph movement with calendar, the Valjoux 7750. The Porsche Design P’6510 Black Chronograph is water resistant to a depth of 100 metres. It is limited to only 911 pieces. calibre ETA Valjoux 7750; self-winding mechanical chronograph; 48-hour power reserve; 28,800 v.p.h. ; 25 jewels; diameter 30 mm (13 ¼ lines); hours, minutes and seconds; date indication; Porsche Design rotor. black; day and date indication at 3 o’clock; 30-minute-counter at 12o’clock, 12-hour-counter at 6 o’clock; small seconds at 9 o’clock; black chronograph counters; white counter hands filled with luminous material in white; white bar indices with luminous material in white; white hour and minute hands filled with luminous material in white; red chronograph hand; white tachymeter scale on the dial. shot-blasted stainless steel case with black PVD coating, push-button and screw-down crown in stainless steel with black PVD coating; anti-reflective, scratch-resistant sapphire crystal; screwed-down case back; water-resistant to 100 meters (10 ATM); diameter 44 mm; height 14.5 mm. shot-blasted stainless steel bracelet with black PVD coating; folding clasp. limited to 911 numbered pieces.